Clearly, the irony escaped them. 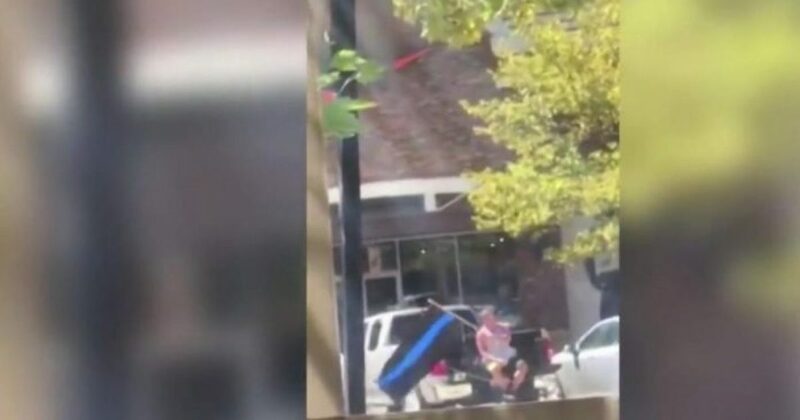 Employees of a Little Rock, Arkansas Nike outlet store called police when they noticed a local man sitting outside their store sitting in the back of his truck, waving a pro-police flag. The Blaze reports that Little Rock resident Jimmie Cavin, who can often be seen in the area showing his avid support for law enforcement and first responders, had been sitting in his truck for about 15 minutes when he was approached by an officer who no doubt appreciated the sentiment of his protest, but was required to respond to a call of a “disturbance” outside the Nike outlet mall Cavin was protesting. Cavin says he didn’t talk to anyone or leave his truck as he waved his black-and-blue flag, which is symbolic of support for law enforcement officers. Now, to be fair, it is understandable the Nike employees would be a little unsettled, considering their company just hired a man who once wore socks featuring pigs dressed as police officers to, you know, protest police brutality, or something. But it cannot go without mention that for them to react by calling the police would cause one to imagine their own personal opinion on law enforcement may have been slightly elevated, causing one to wonder why perhaps they didn’t just appreciate Cavin’s perspective a little bit and go back to selling overpriced sneakers and antimicrobial workout socks. Cavin, on the other hand, told local news that he disagrees with Kaepernick but respects his right to protest, and he was clearly just practicing his own by choosing the Nike store as the next site of his pro-police demonstration, considering Nike had just hired Kaepernick for their controversial campaign. “What better place to show support for police than right outside the Nike store?” he told local Fox 16. Bob Woodward Searched for Two Years for Evidence of Trump-Russia Collusion. What He Found is Telling.